Stephen Dudley, MD, FACS, a board certified ophthalmologist, is a graduate of Purdue University where he received a BS degree in physics. Between receiving his MD degree and completing his residency at the University of Wisconsin-Madison, Dr. Dudley served as a General Medical Officer in the U.S. Air Force for two years. Dr. Dudley then founded The Eye Clinic of the Fox Valley, a successful ophthalmology practice in Oshkosh. 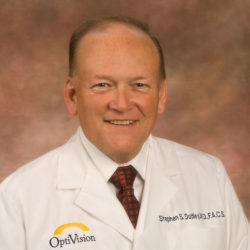 Dr. Dudley is an accomplished cataract surgeon and was the first physician in Wisconsin to utilize the YAG laser for treatment of secondary cataracts. As a visionary and national leader in the field of LASIK laser vision correction, Dr. Dudley performed the first laser vision correction procedure in the state of Wisconsin in 1991. He was the principal investigator of the VISX excimer laser during the FDA approval process and is one of only three certified VISX trainers in the state. Dr. Dudley is a past Visiting Clinical Instructor of Ophthalmology at the University of Wisconsin-Madison, a fellow of the American Academy of Ophthalmology, member of the American Society of Cataract and Refractive Surgeons, and a member of the American Medical Association, the Wisconsin Medical Society, the Milwaukee County Ophthalmology Society, the Sports Ophthalmology Association of the Americas, and a Fellow of the American College of Surgeons. Dr. Dudley and his wife have lived in Oshkosh for over 40 years. He is an accomplished race car driver but is now retired from racing.